Home renovation and building projects can run the gamut from exhilarating to excruciating, and both emotions can surface on any given day. As a homeowner, you are primarily concerned about making the dreams in your head become a tangible reality at a price that doesn’t break the bank. It may surprise you to know that your contractor has the very same goal. People are quick to share horror stories of projects gone awry, which in turn can create tension between contractors and clients, both concerned about whether they can trust each other. However, most contractors run reputable businesses and are committed to integrity and excellence. 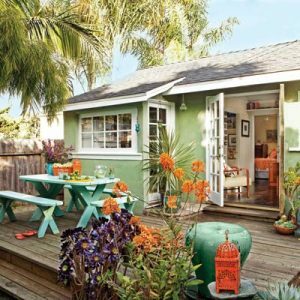 To help start your project, big or small, off on the right foot, here are ten “inside tips” that contractors want you to understand. 1. Reality TV is not reality. HGTV is a goldmine of inspiration, but that is where it should end as far as you are concerned. The budgets and timetables are typically not realistic for the average homeowner, and you only see the glamorized version of problems that arise and how they are dealt with. You are better off to view them largely for entertainment value rather than expertise. 2. The budget and estimate are a big deal … to both of you. Be honest with your contractor right up front about what you can afford. Contractors are not out to take advantage of you. Rather, knowing your budget helps them pinpoint what kinds of products to include in their estimate. They can tell you if your budget is even realistic for fulfilling your dreams. If a quote comes in far and above your budget, it is likely either because you don’t know the value of the things you are asking for or because the contractor had to make a guess at what you wanted. 3. Don’t automatically accept the lowest bid and reject the highest one. First of all, make sure you are comparing apples to apples. The lowest bid might be based on inferior products or might not allow for issues that pop up along the way, meaning you will be charged extra when the job comes to completion. The highest bid might actually be the most realistic one, and contractors are willing to work with you to figure out your “must haves” and your negotiables to get the cost in your ballpark. They don’t mind collaborating with you to find that “sweet spot” in your budget as long as you trust them to be honest and fair. You can always find someone cheaper, but you typically get what you pay for. Look beyond mere budget and consider knowledge, experience, and recommendations as you make your selection. 4. Don’t purchase your own materials, and if you do, let your contractor know before any paperwork is signed. Homeowners are often afraid that a contractor is marking up his products unreasonably and that they could get a better price on their own. In actuality, a contractor already gets a discount on products, often better than what you would find on your own. And yes, he will mark it up so he can make a profit, but if you want your contractor to be successful, allow that margin to go to him instead of the supplier. Additionally, if you purchase the products, then you assume responsibility for them if anything goes wrong. If the contractor purchases the items, he assumes all the risk. 5. Your contractor is not trying to take advantage of you. You would be surprised at all the behind-the-scenes aspects of running a construction business. When your contractor prepares an estimate, he must factor in all of his time spent preparing the bid, ordering products, meeting with subcontractors, picking up supplies, and paying his bills. Your money is not going straight to his wallet! It also needs to cover health insurance, office supplies, vehicle maintenance, taxes, accounting fees, tools, and payroll. He must find a way to meet your expectations while also providing for his family and his business. A job goes most smoothly when both you and your contractor respect and trust each other. 6. Allow your contractor to choose his own subcontractors. A project cannot happen without the help of masons, electricians, plumbers, and a host of other professionals who all excel in their own fields. Your contractor has worked hard to develop a team that he trusts, who he knows will deliver results with excellence, and who will be able to troubleshoot when problems arise. He doesn’t know your uncle or friend, and although they might be good at what they do, the project will run more smoothly if he can pick his own team. 7. Your contractor can’t predict everything that will happen. In a perfect world, your contractor will propose a timetable and everything will unfold as planned. But realistically, permits get delayed, weather interrupts the schedule, products get shipped late, and surprises lie behind every wall and under every floor. Be patient and allow them to handle these problems as they arise. That’s their job, and they are good at it, so responding angrily does not help you or them and can damage your working relationship moving forward. Typically, these things are not their fault, but even if a contractor makes a mistake, he knows it is his job to fix it, and he probably feels much worse about it than you do! 8. Don’t try to help with the project. Your assistance will not necessarily help cut costs or speed up the timeline. 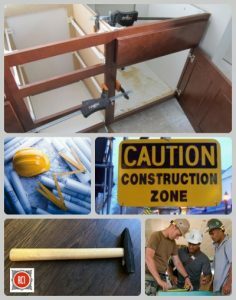 In fact, many times a homeowner’s lack of experience or expertise slows things down or results in the contractor having to compensate for your errors. And a beautiful project can be completely ruined by a poor final paint job, so unless you are truly an expert in your field, allow the professionals to do their work! 9. Please make your payments on time. Contractors have to cover a lot of expenses out of their own pockets, trusting in good faith that you will pay when they send you a bill. Making a late payment can put undue stress on a contractor and make it difficult for him to continue running his business efficiently. You should always have your financing in place before a project begins to avoid any financial strain on you or your contractor as the project proceeds. 10. Allow the contractor to carry the stress for you. Yes, renovations and home building projects are extremely stressful. However, your contractor is an expert, so allow him to handle it for you. This is why you hired him in the first place. If you have concerns, please address them immediately with your contractor so he can put your mind at ease and you can get back to enjoying life while you wait for the project to be completed. Contractors love when a final project meets the homeowner’s expectations. They enjoy the feeling of a job well done, and they value your recommendations to your family and friends. Understanding their perspective will help both of you work together effectively to see your dreams come true, and in the end, a good relationship will only make the finished product that much sweeter. A kitchen or bathroom countertop is likely one of the hardest used surfaces in your home. When it comes time to choose or replace it, there are a number of factors that should be considered. Although the aesthetic appeal may feel most important at first glance, ponder the following questions before starting your search. What is my primary reason for purchasing this countertop? What level of durability is necessary for this countertop location? How much maintenance am I willing to contribute? Is there a wide range of options to choose from? Do I have the skills and tools necessary for a DIY installation? 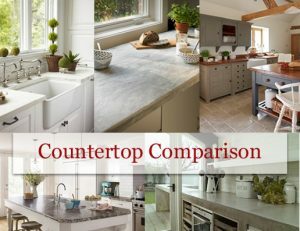 To help simplify the decision-making process, we’re presenting the most popular and trendy countertop options, outlining the pros and cons for each choice, and summarizing the primary reason for selecting each one. QUARTZ: Quartz is an engineered stone, created to become a better alternative to granite or marble. It can be custom fabricated with a large range of color options. It continues as a top trend because it is non-porous (requiring no sealant), is scratch and stain resistant, and is easy to maintain and clean. Quartz is one of the more expensive countertop options and is typically not DIY friendly. CHOOSE QUARTZ … if you are looking for the best overall countertop material and you have an ample budget. 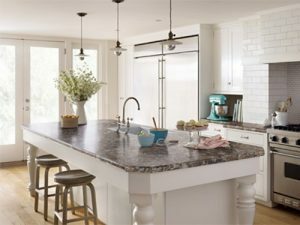 GRANITE: Granite is considered a luxury countertop choice. Although it can be expensive, the cost has decreased in recent years. With a wide variety of options, it is strong and durable and withstands heat, making it a great kitchen option. It can be buffed to a glossy shine and adds real estate value to a home. Because it is porous, it will require occasional resealing, and it can crack if not properly installed. It is best to hire a professional. CHOOSE GRANITE … if you prefer a more elegant, high-end look for your kitchen and want to increase your real estate value. MARBLE: Marble is a wonderfully unique material. No two sheets are the same, with each having its own unique graining. While it is waterproof and heatproof, it also scratches and stains easily and can be difficult to repair. 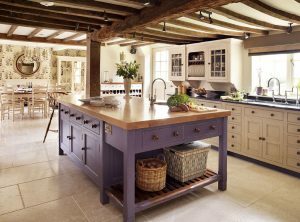 Because of its high cost, it is often used for just a section of a kitchen, such as an island or a baking station. It is considered a benefit when it comes to resale of your home. 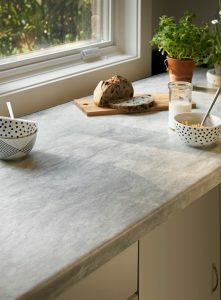 CHOOSE MARBLE … if your primary goal is to achieve a distinctly unique look for your kitchen. WOOD/BUTCHER BLOCK: Wood countertops have increased in popularity in recent years. They offer a warm, quaint look and are generally affordable. With a wide range of colors and finishes, they can be sanded and resealed as needed, making them a long-lasting option. They do require regular resealing or oiling, but they can be easily cleaned and maintained with regular household cleaners. Wood countertops show water damage and should not be used for direct food preparation due to bacteria. It is not recommended that you use wood in a bathroom. CHOOSE WOOD … if your home has a relaxed, country vibe. 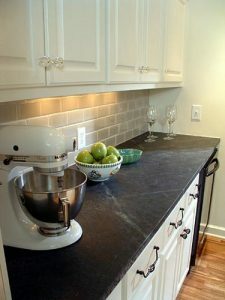 SOAPSTONE: Soapstone is a natural product, typically dark gray in color with varied veining. It is non-porous, which makes it healthy and safe, and it is considered durable and stain resistant. While it is a softer material, scratches can easily be sanded out. It requires regular treatment with mineral oil and develops an antique-like patina over time. A DIY installation is not recommended. 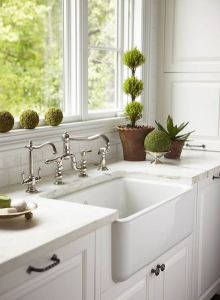 CHOOSE SOAPSTONE … if you have a historic home and prefer materials that are environmentally healthy. STAINLESS STEEL: Stainless steel counters have increased in popularity with the trend toward contemporary, industrial kitchens. Some of its merits include that it is heat resistant, seamless, durable, and easy to clean. Stainless steel is a more expensive option and can be noisy depending on its usage. While it scratches easily, you will get a good return on your investment with this material. CHOOSE STAINLESS STEEL … if you have a modern kitchen and prefer clean lines and easy maintenance. 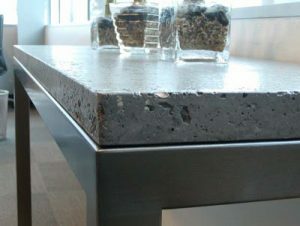 CONCRETE: Concrete countertops are considered unusual and offer the possibility of unique decorative features. They can be color tinted to match your kitchen and are relatively durable as well as heat and scratch resistant. Because of its porous nature, it will require regular resealing. It is also prone to crack if not properly formed, so it is best to hire a professional, although the cost is primarily due to labor rather than materials. CHOOSE CONCRETE … to create a one-of-a-kind look. LAMINATE: Laminate countertops are made of particle board covered with a plastic-coated synthetic material. Historically they are considered a low-end option, but with an increase in color and pattern options, they are steadily on the rise. Laminate is inexpensive, easy to clean and maintain, and DIY possible. Visible seams and dents or scratches can inhibit resale. CHOOSE LAMINATE … if you own a rental property or are living in a temporary home. With all the countertop options on the market, knowing your criteria before beginning your search will save you a lot of time and stress. 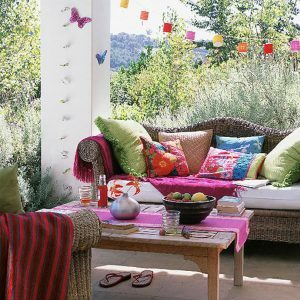 As with all design choices, this is another way to express your unique personality while creating a home that best fits your own personal needs.